peaches + bourbon = weekend. I subbed bourbon for the rum in Kaela’s Pirate Peaches, and boy, am I excited to enjoy these. My entire kitchen (okay, apartment) smells slightly of sweetness and spirits. (Yep, present tense. Batch number 2 is simmering away on the stove, prompted by the fact that a tiny piece of peach prevented one of my jars from sealing properly. Rather than re-process a single jar, I dumped the contents back into the pot with another pile of peaches that were macerating in the fridge, along with the partial jar of leftovers that I didn’t process yesterday [to get me back up to 3 lbs of peaches], added more sugar, more booze, and the appropriate amounts of lemon juice and zest, and I am once again enjoying the aroma of peaches simmering in bourbon.) This time, I’m going to try to get the peaches a bit softer than they were yesterday, and I may even break out the immersion blender to make more of a sauce. I ran into trouble yesterday with the ratio of end-of-season peaches (which I think are harder than peak juicy peaches) to booze/syrup, which is why I had some leftovers. See? 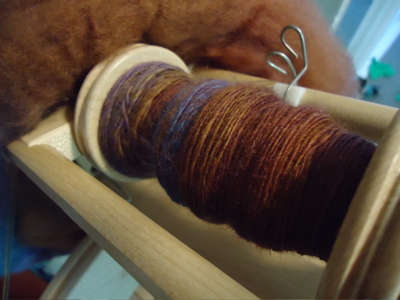 I also did some spinning. I am mostly through the second bobbin of my reflection SCF bfl, and am looking forward to plying this soon. Happy weekend! This entry was posted in CSA veggies, kitchen, spinning and tagged BFL, bourbon, canning, kitchen, local kitchen, peaches, pirate peaches, reflection, sauce, spinning by barefootrooster. Bookmark the permalink. The peaches look wonderful. You have an envious amount of goodies stocked in your pantry already! Your spinning is very pretty. I like the earthy colors. Any idea what you would like to make from it? Do you have a project in mind yet? All your canning inspired me – I have a batch of plums waiting to be turned into jam tomorrow! Lovely yarn! The new wheel is sitting in my living room now :-) Have a nice Sunday! That sounds really good. 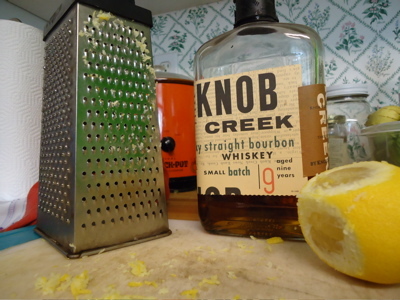 So good I may send P to the store for some bourbon. Awesome. All of the above. I love that Bourbon label. I’m sure your peaches are absolutely amazing. Your spinning is gorgeous ~ lovely colour! I think I could get beyond my aversion to peaches if they were soaked in bourbon. But that is true of most things, I imagine. Very pretty yarn, perfect for fall! 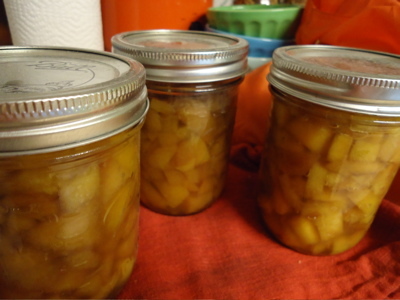 Boozy peaches are delicious! I have found that they taste a even better after they’ve had a chance to mellow for a few months. Or maybe it’s just the fact that a few months after peach season is deep midwinter, and some boozy peaches taste like liquid sunshine when it’s cold outside. Yum! I had the same problem with my late-season peaches; impossible to peel (I had to use a knife on quite a few of them) and super-frustratingly-impossible to pit. Clingstone, indeed. 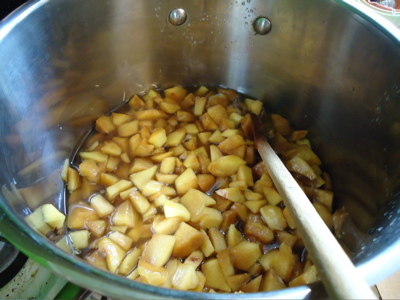 Next year I have to figure out a peach chutney with peel on recipe….